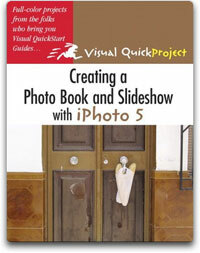 I’m happy to announce that Peachpit Press is about to publish my third book in the Visual QuickProject Guide series: Creating a Photo Book and Slideshow with iPhoto 5. Instead of drowning you in theoretical possibilities and lengthy explanations, this Visual QuickProject Guide uses big, color illustrations coupled with clear, concise step-by-step instructions to show you how to complete two specific projects in a matter of hours. Our projects in this book are to create a photo book and a slideshow from a library of digital photos using Apple’s iPhoto software. iPhoto is an ingenious program that first helps you organize your photos with its labels and keywords, and then offers beautiful layouts for displaying your photos on paper or on screen. The photo book and slideshow that yoursquo;ll create in this book chronicle the adventures of a trip to Barcelona. Because the projects cover all the basic techniques, you’ll be able to use what you learn to create all sorts of other photo books and slideshows--perhaps to share pictures of your children with relatives, make a family heirloom album of photographs from your brother’s wedding, develop a product catalog for your business, or create an onscreen portfolio of your artwork. Why use iPhoto to organize your photos and create photo books and slideshows? Digital cameras free you to take thousands of photos. Too bad they’re all labeled something like “4653.jpg”. iPhoto helps you organize your photos so you can find them, and then provides intuitive, powerful tools for combining them into beautiful collections that you can view on paper or on screen.